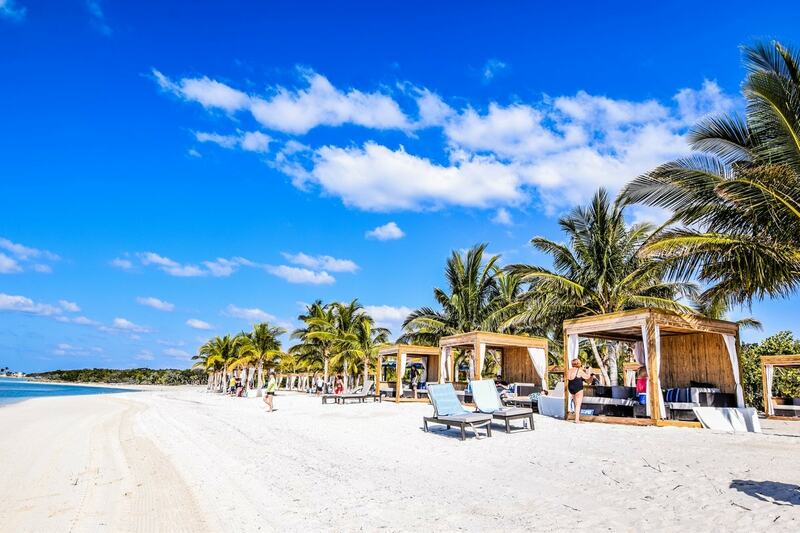 Guests visiting Royal Caribbean's private destination of CocoCay are certain to find plenty to do in their time onshore, including a private area just for them in the Beach Bungalows. Royal Caribbean added Beach Bungalows to CocoCay in 2016, which offer guests a private area of the beach just for guests in bungalows. 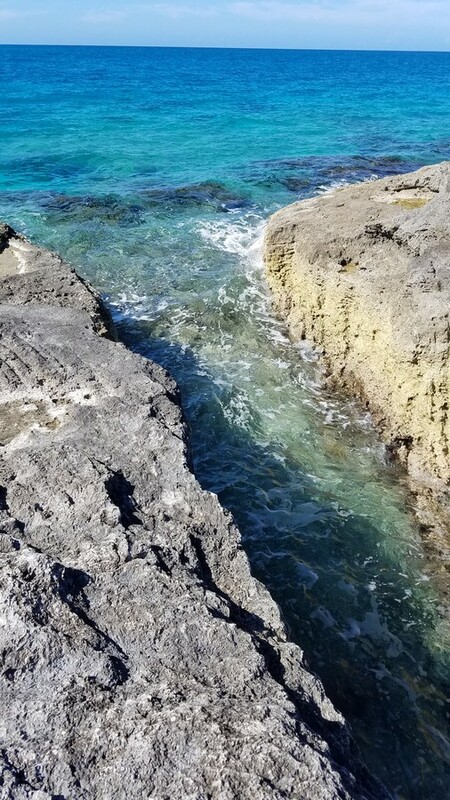 While on a recent cruise to CocoCay, we tried out the bungalows for ourselves to evaluate the option. The Beach Bungalows cost us $195, and can accommodate up to six guests. 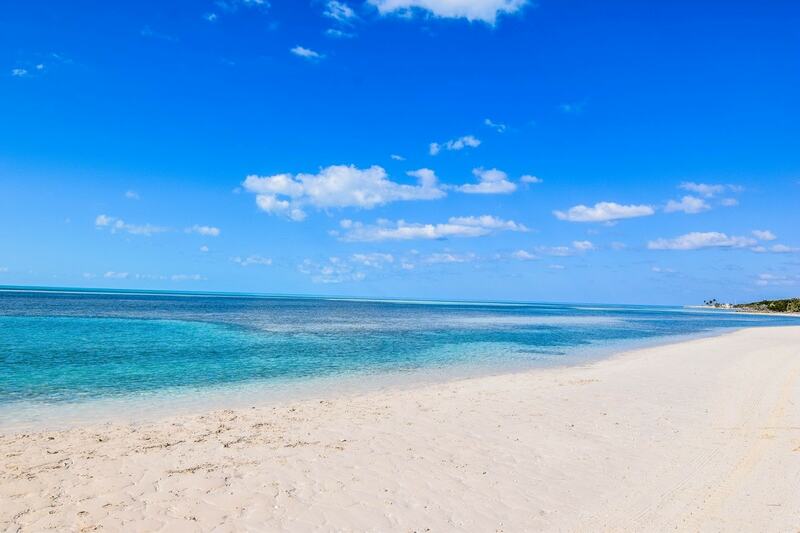 Each bungalow rental is good for the entire day spent in CocoCay. They are located in the South Beach area of the island, which is a good distance from where guests disembark from their tenders. Royal Caribbean offers complimentary transportation to and from the Beach Bungalows via its private Cocolimo shuttle transportation. Upon arrival at the Beach Bungalow area, guests check-in with the concierge desk to have a bungalow assigned to them. Each bungalow includes two floating mats, a cooler of bottled water and beach towels. As mentioned, the Beach Bungalows are located in a rather secluded area of the beach, which means less crowds. It is about a five minute walk down the beach to the floating bar. Other destinations on the island can be reached easily by requesting a cart ride from the concierge, which is complimentary. The bungalow itself comes with a large couch and coffee table. There is enough room to comfortably seat four adults inside. There are also two beach lounger chairs that are just outside the bungalow, which provide even more seating options. Each bungalow only has one full wall (in the back), but there are curtains that can be extended to provide more privacy and/or shade. 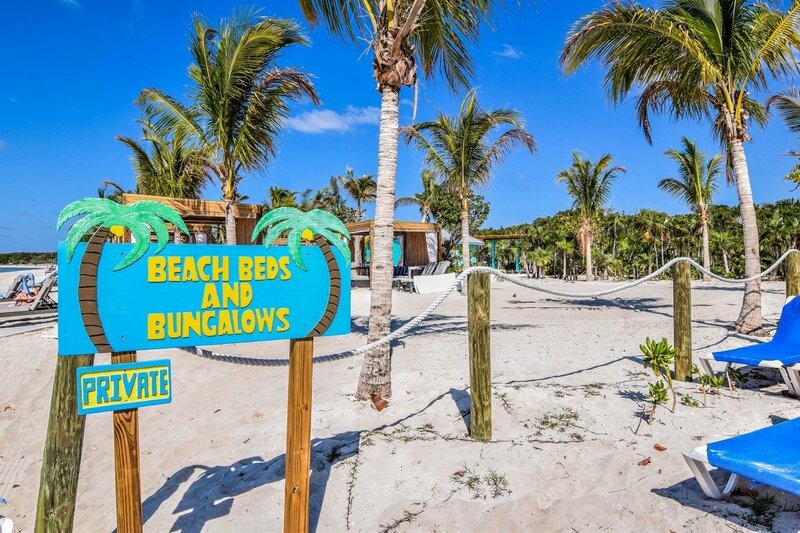 Unlike the cabanas in CocoCay, the Beach Bungalows have direct beach access, which means guests can exit their bungalow and walk right to the ocean, as opposed to the cabana guests who must exit the cabana area and then go into the ocean nearby. 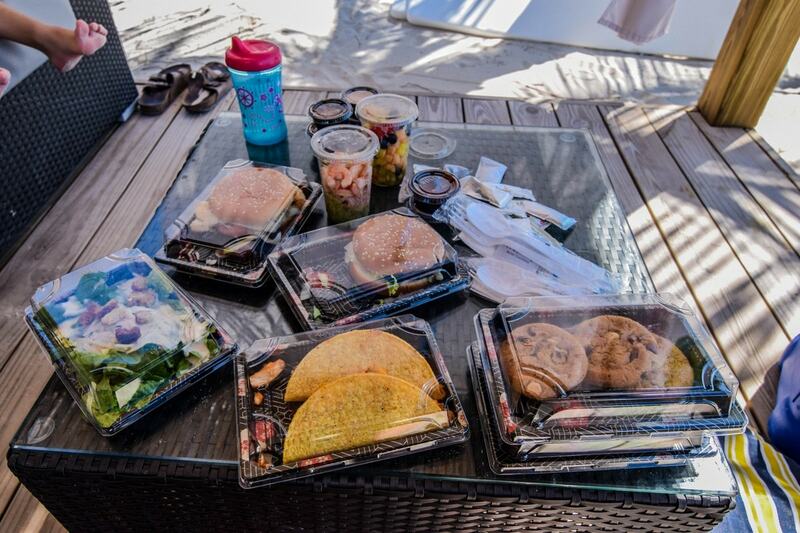 During our stay, in lieu of the usual lunch buffet offered, all Beach Bungalow guests were given a new menu to pre-order their lunch. The selected options would be delivered to the bungalow when it was ready. Depending on your culinary preferences, the menu ordering system can be a good or bad thing. Personally, I enjoyed having more options than just typical BBQ food, as well as not having to take my kids to the buffet. Delivery to the bungalow provided an extra level of service than I was expecting. Just like delivery food at home, certain foods can deteriorate quickly in the interim period between preparation and delivery. Moreover, the cooked food items tended to be not as hot because of the delivery lag time. Still, not having to leave the comfortable confines of my bungalow was not to be overlooked. There is a dedicated bar at the rear of the Beach Bungalow area, along with servers coming occasionally by to offer Coco Loco drinks. 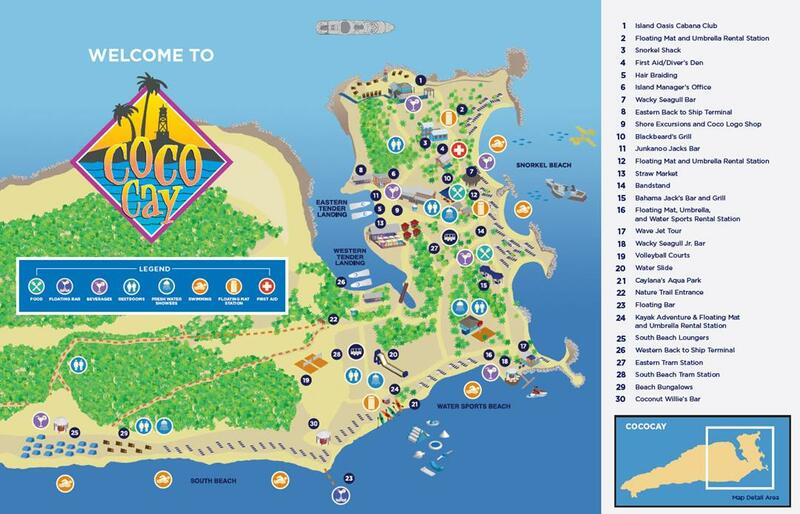 Additionally, restrooms are located just behind the Beach Bungalow area and are a very short walk. 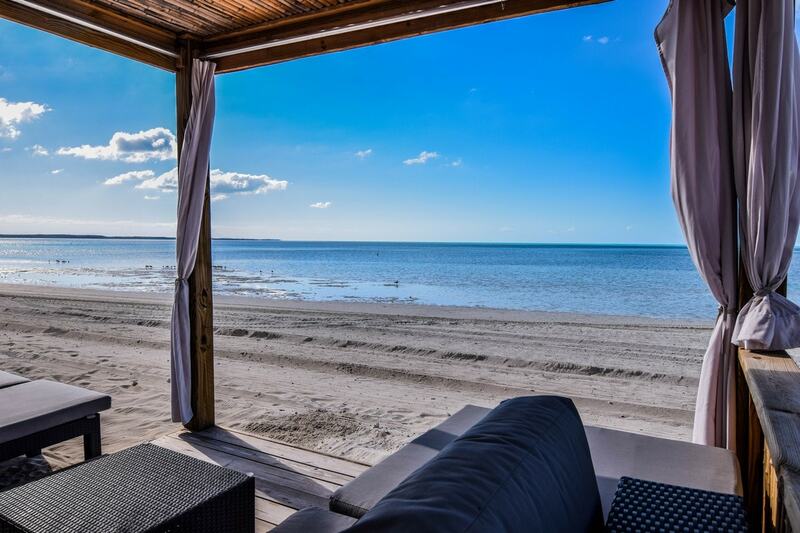 Overall, the Beach Bungalows save a little bit of money over their cabana counterparts while providing significantly more living space and privacy than the less expensive Beach Beds. 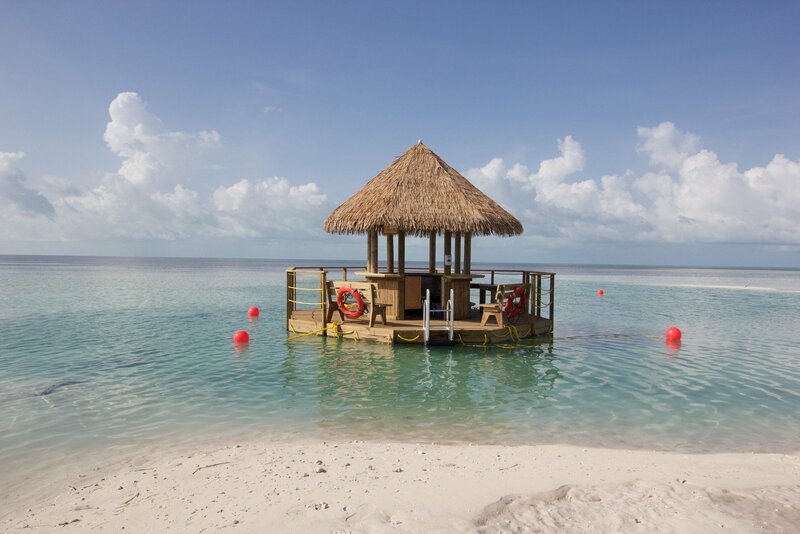 The CocoCay Beach Bungalows are a great choice for families or groups that want to have a private area to sit, with easy access to the beach and lots included with the price. 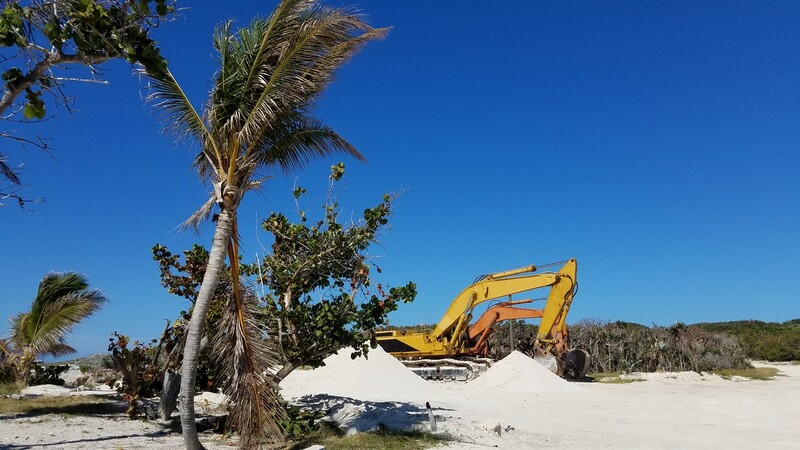 Earlier this month, Royal Caribbean announced a massive expansion to its private destination of CocoCay, and already work has begun in earnest. RoyalCaribbeanBlog reader Michael Osypowski shared with us these photos of the construction progress happening there. Our first set of photos are of where the new pier appears to be installed. These photos are from the rear of CocoCay. It appears a backhoe has been use to dredge out a lagoon. 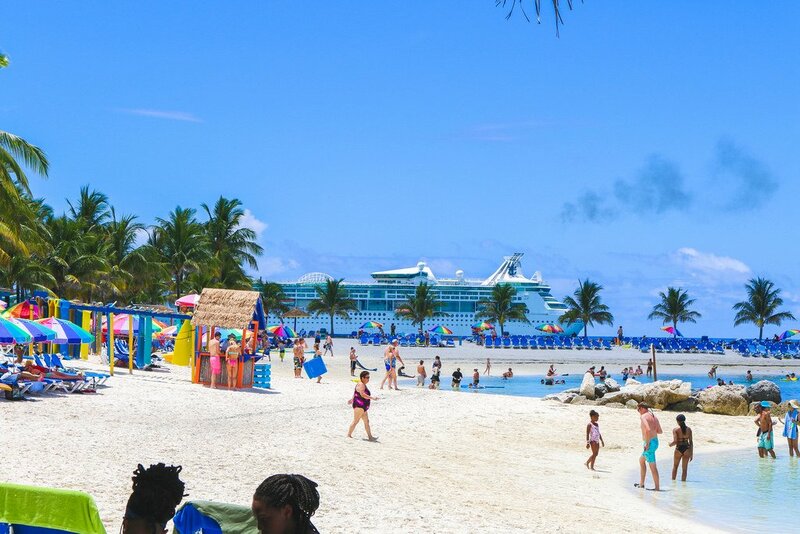 Royal Caribbean indicated the improvements to CocoCay will take a multi-phased approach, with some elements of the new construction ready in 2018, and construction complete sometime in 2019. 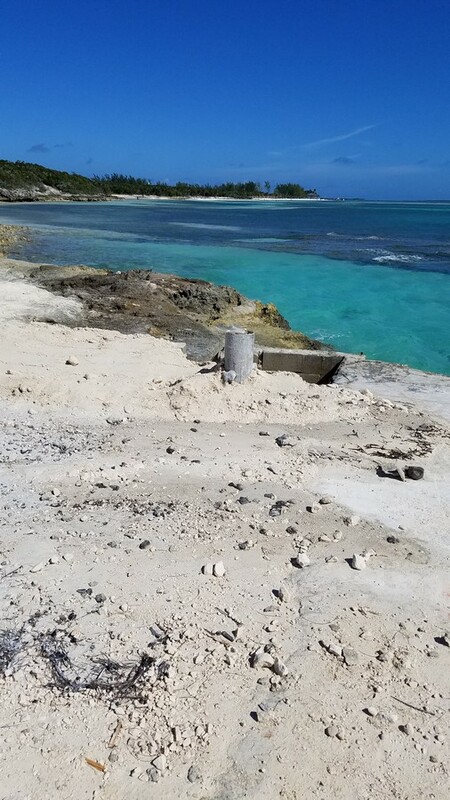 Hurricane Matthew inflicted damage to many areas of the Bahamas, including Royal Caribbean's private destination of CocoCay. The cruise line has skipped scheduled stops there since the storm passed, but will resume calls later this week. 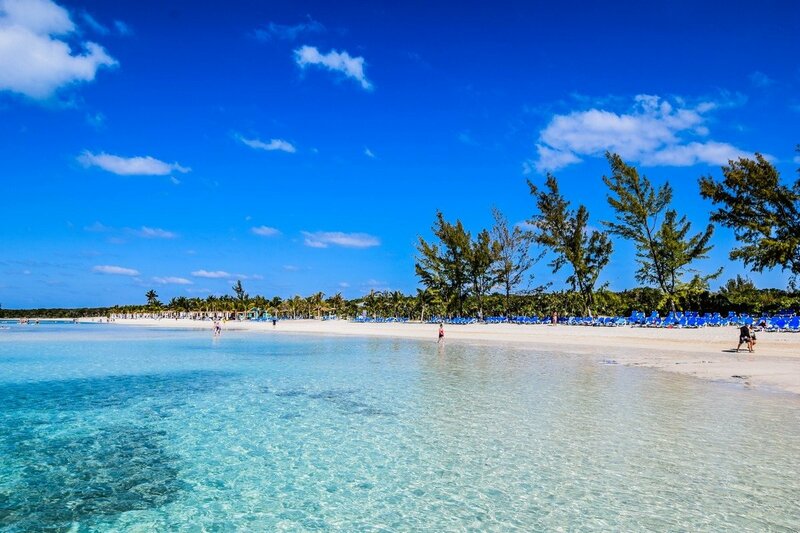 CocoCay is scheduled to welcome guests back starting on Saturday, October 15. If that schedule holds up, Enchantment of the Seas should be the first Royal Caribbean ship to return to the private destination on that date. 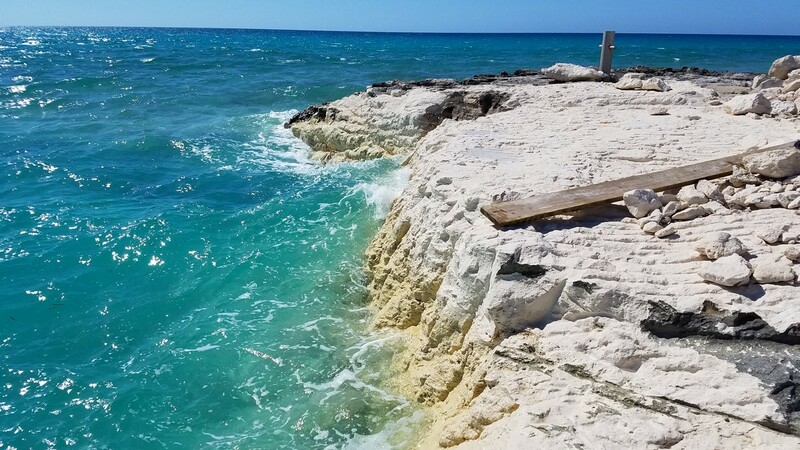 The extent of the damage to CocoCay has not been disclosed, although Royal Caribbean CEO Michael Bayley issued a letter to guests last weekend that indicated the cruise line was working with Bahamian officials to help repair and restore services in the region. "There are fewer details to share yet in the Bahamas, but he need will no doubt be great, and we will do all we can to assist. We are in contact with the Bahamian government to understand their most urgent needs and how we can help." 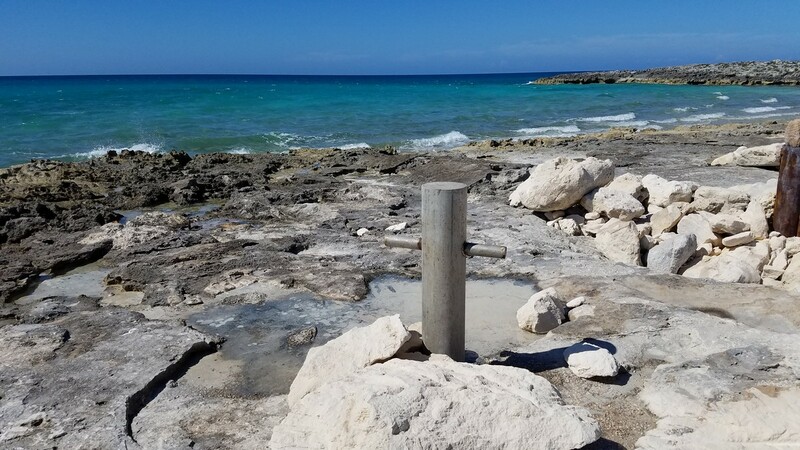 Ever since Hurricane Matthew passed through the Caribbean, many Royal Caribbean fans have been concerned about what damage the storm had on the cruise line's private destinations. Royal Caribbean CEO Michael Bayley shared an update with guests aboard Allure of the Seas. Here is the excerpt from the letter regarding Labadee, "In Haiti, the area near Cap Haitien that is home to Labadee was thankfully spared the worst of the storm. Our staff was able to remain onsite throughout the week and is making sure the facility is in a clean and safe condition. The school we operate for local children was closed for several days but class will be back in session next week." In regards to CocoCay, there were fewer details that Bayley shared, "There are fewer details to share yet in the Bahamas, but he need will no doubt be great, and we will do all we can to assist. We are in contact with the Bahamian government to understand their most urgent needs and how we can help." 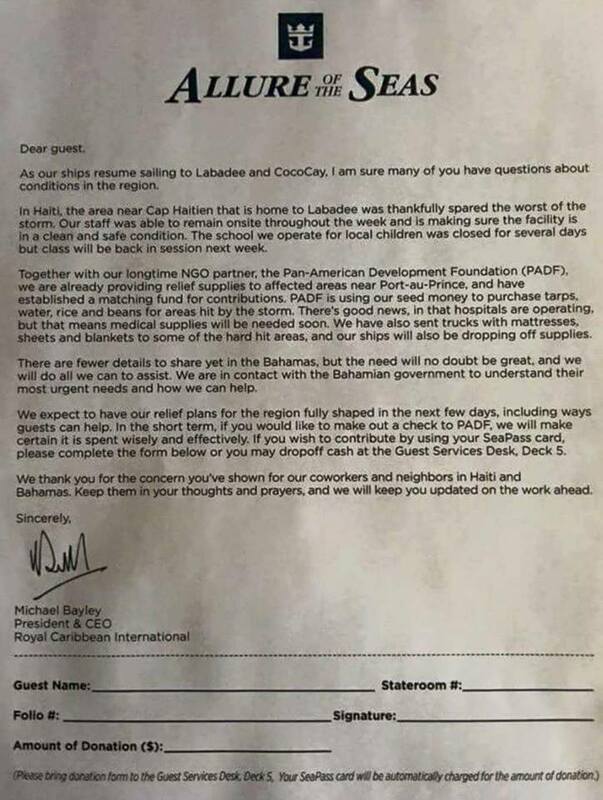 Royal Caribbean is also providing aid and supplies to the people of Haiti, as outlined by Bayley in the letter, "Together with our longtime NGO partner, the Pan-American Development Foundation (PADF), we are already providing relief supplies to affected areas near Port-au-Prince, and have established a matching fund for contributions. PADF is using our seed money to purchase tarps, water, rice and beans for areas hit by the storm. There's good news, in that hospitals are operating, but that means medical supplied will be needed soon. We have also sent trucks with mattresses, sheets and blankets to some hard hit areas, and our ships will also be dropping off supplies." Royal Caribbean is actively working on providing ways for its guests to donate to help support these efforts, "We expect to have our relief plans for the region fully shaped in the next few days, including ways guests can help." If you would like to donate towards the rebuilding efforts, consider a donation to the Help Haiti Now effort by PADF. 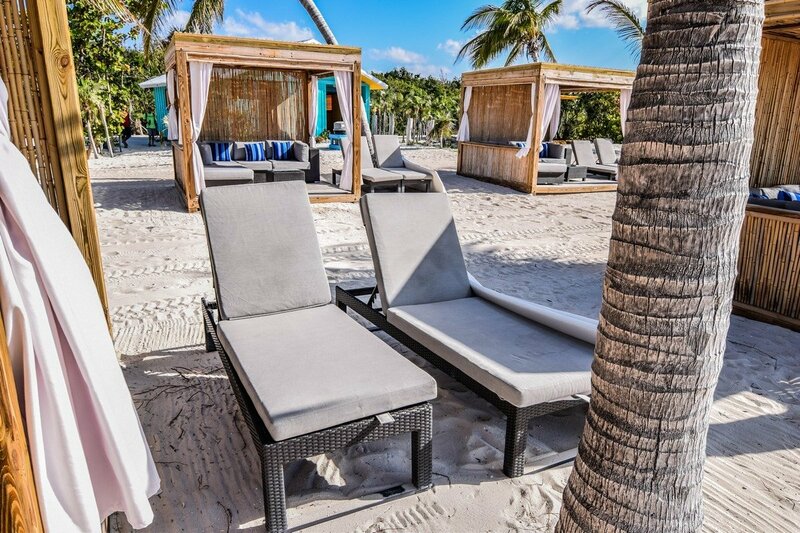 The Beach Loungers at Royal Caribbean's private destination of CocoCay have been a popular choice for guests that want shade from the sun, along with some additional perks, but those perks appear to have been removed from a Beach Lounger rental. 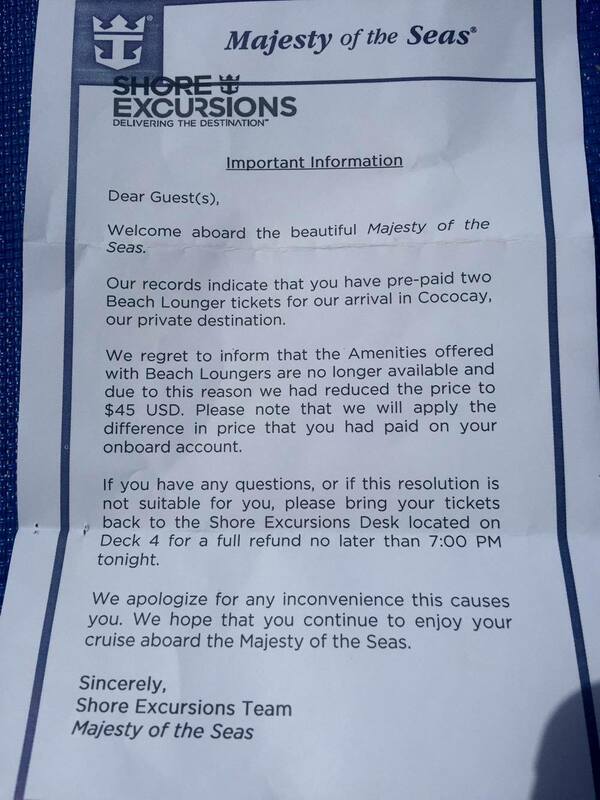 A Royal Caribbean Blog reader aboard Majesty of the Seas had reserved a Beach Lounger prior to her cruise, and received this letter to inform her that the benefits of the Beach Lounger have changed. The big changes are the amenities previously offered are no longer included, and that has resulted in a lowering of the price to $45. 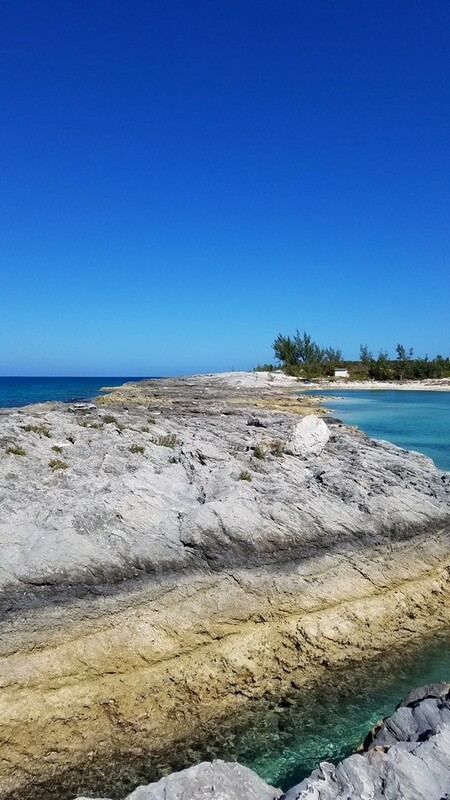 Please welcome guest blogger Kayla Gillman, who is here to talk about her recent visit to Royal Caribbean's private destination of CocoCay in the Bahamas. 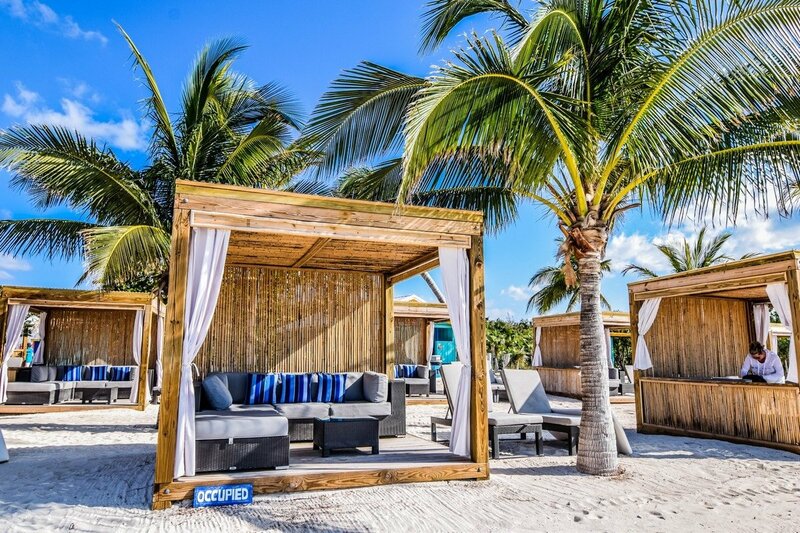 For an upgraded beach experience on Royal Caribbean's private island Coco Cay without the cost of a cabana, you may want to consider the shaded Beach Loungers located on the South Beach of CocoCay (the beach formerly known as Barefoot Beach). I recently had the chance to visit the island while aboard Majesty of the Seas, and since it was my friend's first cruise, wanted to do something a little extra special during our visit. We disembarked the ship in the morning around 10:30 AM, and made our way to the Shore Excursions desk on the island. Here, we were asked to step around to the back of the building where a tram quickly scooped us up, and brought us on our way down to the Lounger area. 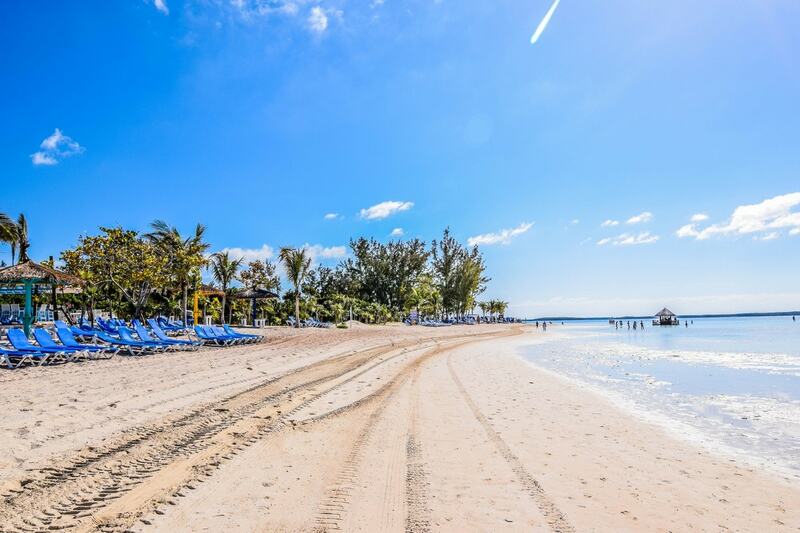 If you are not a fan of long walks on the beach, this would be a great option for you. 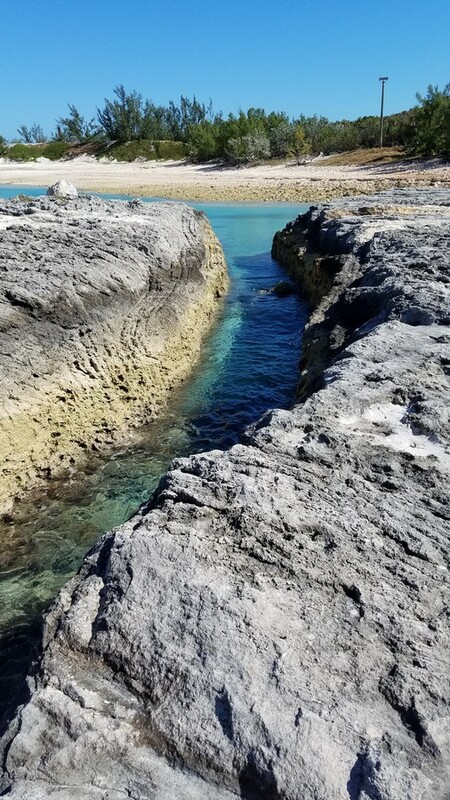 However, I have found that walking down to this area of the island to be quite enjoyable as you get a chance to see the vast majority of the island along your way. Upon arrival, we walked over to the shaded bar area where we were greeted by our attendant. She handed us our towels, and showed us which loungers were still available to us (the loungers are available on a first come; first serve basis so if you have a particular space in mind plan on getting there early). We selected our lounger, and our attendant followed us with a cooler of water and a fruit plate. Our two beach mats were already brought out and leaning up against one side of our clamshell lounger. 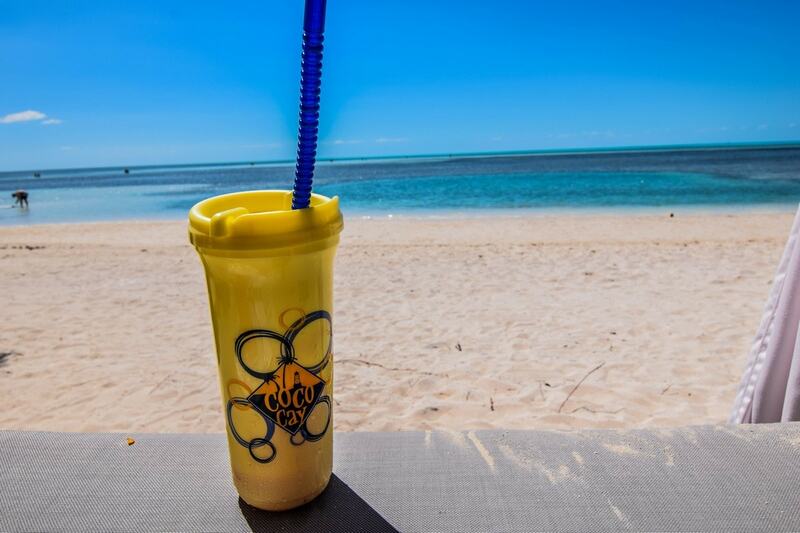 We relaxed for a little bit and grabbed a Coco Loco (souvenir cup and all!) from the bar where we were first greeted by our attendant, who was available there for us the remainder of the day. I have to say, I thought that for what we paid for two people this was an excellent value as the beach mats alone run $18 per person. 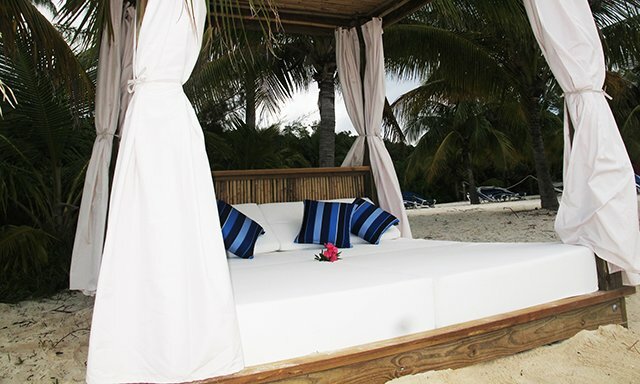 We very much enjoyed floating along the beach with our drinks and relaxing in the shade of our cabanette. I would highly recommend this to anyone looking for a quiet, calm beach day. It also appears that there is quite a bit of construction happening in the area – it looks like there have been some new cabana structures added to the area as well, but I did not notice them in use. Need a break from lounging around? 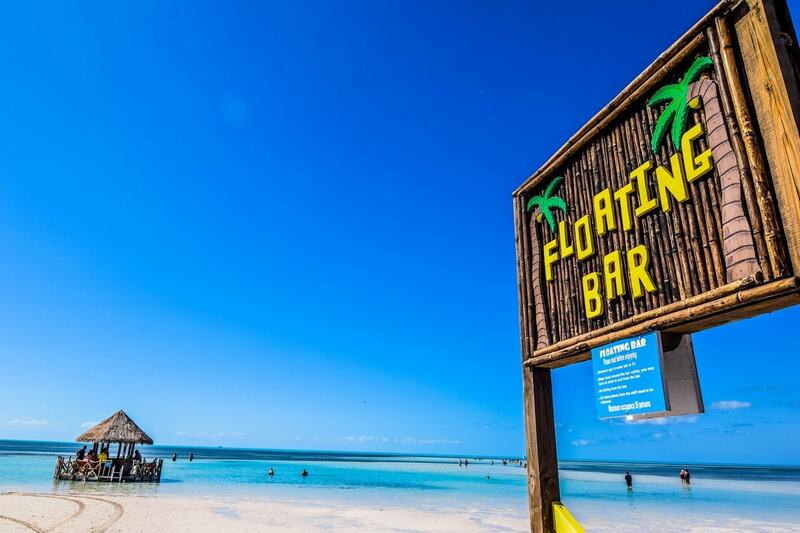 The excitement of the brand new Floating Bar is just a quick walk away – you can see it from your lounger! We swung by here for a quick drink, and I have to say this is quite a welcome and fun addition to the beach. At the end of our day, we turned our towels back in to our attendant and wandered our way back down the beach and made our way back to the tenders. Looking forward to the chance to book one of these loungers again and enjoy a fun day on Coco Cay! Beach Loungers may be reserved ahead of your cruise via the Cruise Planner. 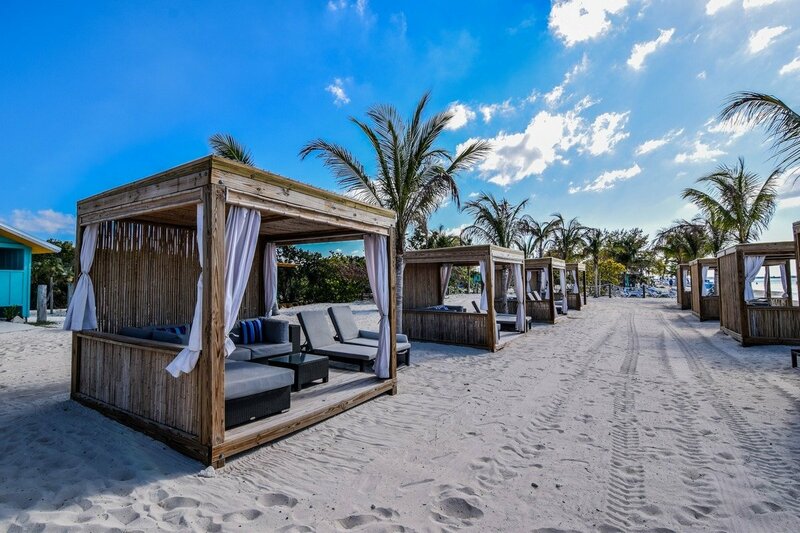 They run $59.00 for two people, and included you receive 2 floating beach mats, 2 bottles of water, towels, and transportation in addition to the reserved shaded "clamshell" loungers. Keep in mind when reserving the loungers, that you will only need to book under one person – this will cover the admission for two people to your lounger. 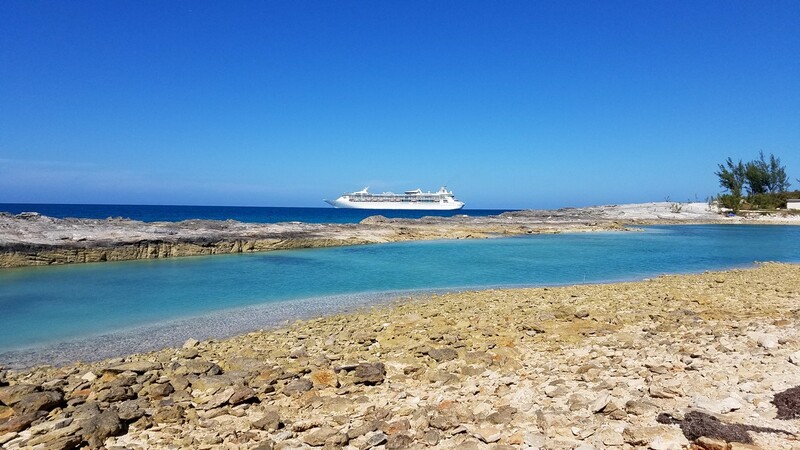 Guests visiting Royal Caribbean's private destination of Coco Cay in the Bahamas will have something new to try on their next visit. Royal Caribbean added a new swim up bar for guests to enjoy while out for a swim. It is located near South Beach/Barefoot Beach. 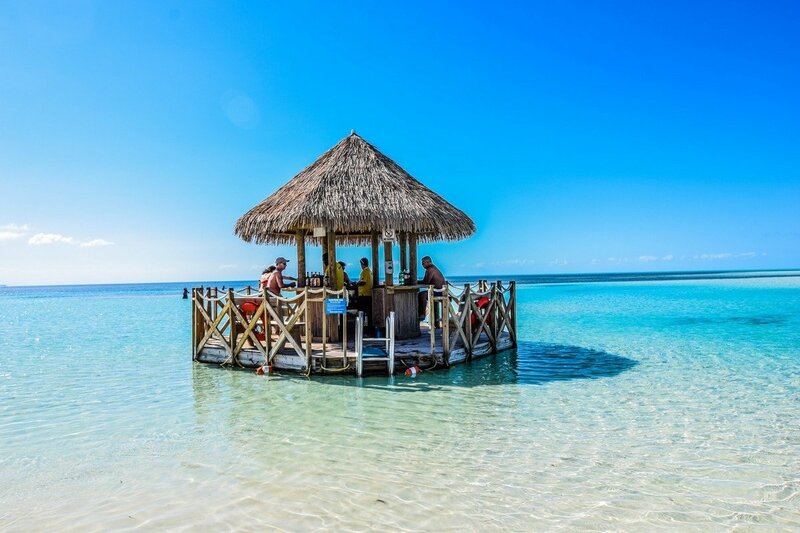 The new bar is floating in the ocean, which means guests have to swim to it in order to get a drink. Michael Poole reports the new bar was added just a few weeks ago. 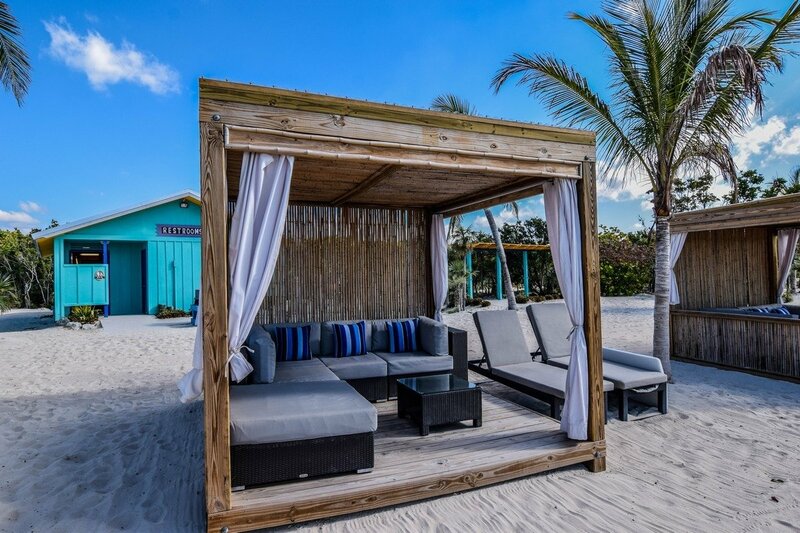 Royal Caribbean is in the midst of upgrading a number of experiences on the island, including new cabanas and even a dock for the island. 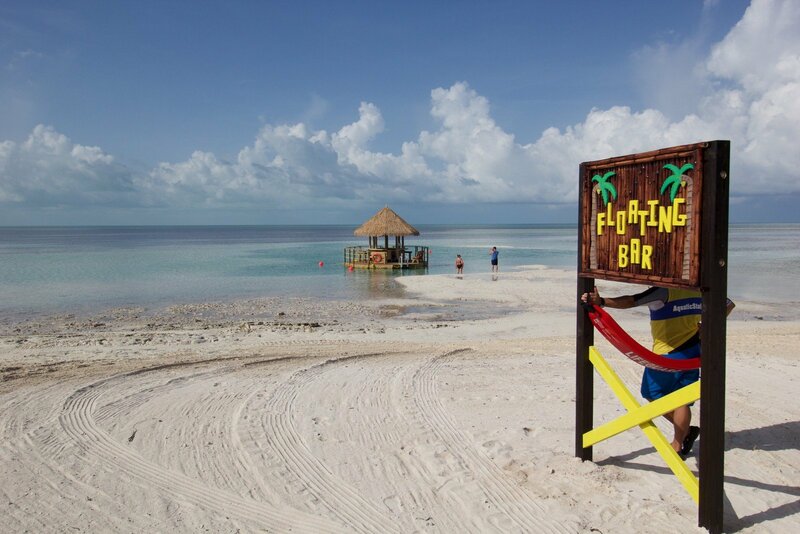 Do you want to try this bar on your next cruise stop in Coco Cay? Tell us your thoughts in the comments!